I know nothing about Matt Gaser prior to getting the book and I'm pleasantly surprised by the beautiful artworks collected within. 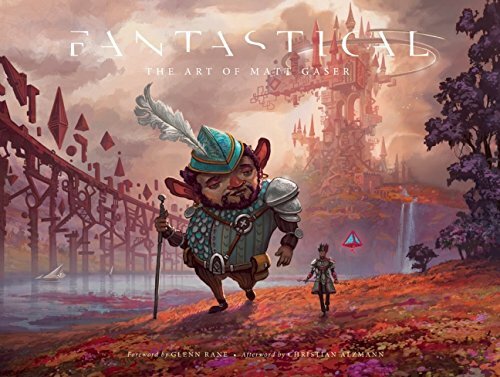 This is a 112-page hardcover featuring the personal artworks of Matt Gaser, an illustrator and concept artist from Northern California. The book features lots of sketches and detailed coloured paintings. The subject matter is a mix of sci-fi and fantasy. Matt is good at both and is able to create really believable worlds and characters. The character and creature designs are wonderful. There the more cartoon-like ones and also the more realistic pieces. Most of all, I like the settings where the characters are based. Even if it's just a glimpse of the background, it adds depth to the main character art. The colour paintings are also gorgeous. The lighting and colour schemes are lovely. They are coloured in a stylised manner as oppose to total realism and that is the Matt Gaser's style to fantasy and sci-fi. You should also check out more artworks on his website. Many artworks appear more vibrant on his website compared to the printed version in this book.